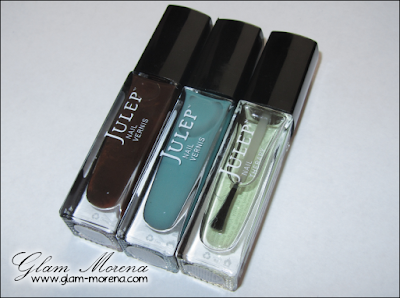 Glam Morena: Julep Maven & Julep Polish Giveaway. Julep Maven & Julep Polish Giveaway. About a month ago I did a post on a new monthly box called the Julep Maven. Click here to view more information about it. When you purchase your 1st box you will get over $70 worth of product and future boxes are worth $40! Julep Maven normally costs $19.99, but you can get your first box 50% off or for $9.99 if you use the code WELCOME50. Don't forget to click here to sign up! The best thing about signing up for Julep Maven is that ALL products are full-sized, free shipping on all orders, and 20% for Julep Mavens! 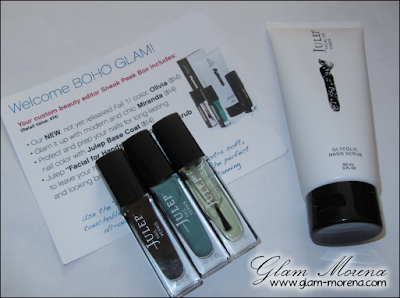 I ended up getting the Julep Maven for Boho Glam after taking my style quiz! That's $74 worth of product for only $9.99! Be sure to watch the video for swatches of all the Julep Nail Polish! I also did a collective haul of some Julep nail polish! Don't forget to check out my Julep Nail Polish Giveaway! 2 subscribers will win a polish of their choice. Opened to the U.S. and Canada only. Are you signed up to Julep Maven? Favorite shade?